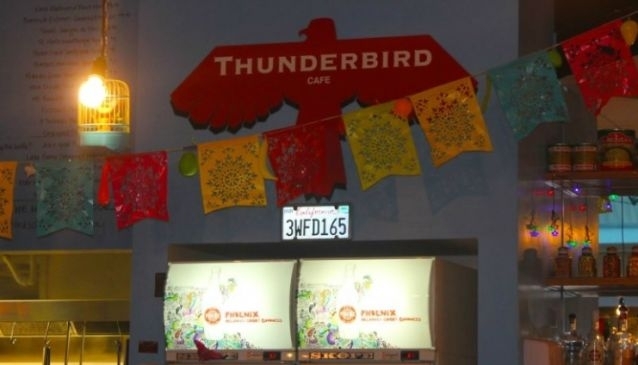 Thunderbird Cafe is a small and fun cafe that's situated on Featherstone Street in Wellington's downtown area (between Brandon and Panama Streets). From Wednesday to Friday Thunderbird Cafe is open for dinner with live music played on Thursday and Fridays.The cafe has daily specials. Monday: 7.00am - 4.00pm / Tuesday: 7.00 - 5.00pm / Wednesday to Friday: 7.00am - 9.00pm / Saturday and Sunday: 9.00am - 4.00pm & 9.00am - 3.00pm..